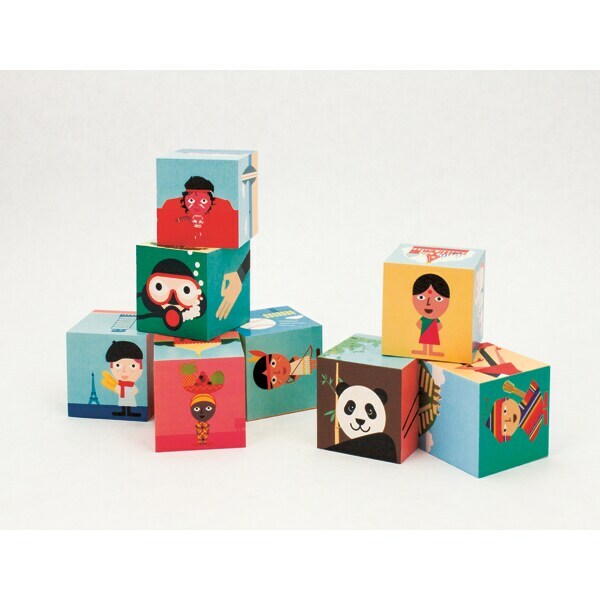 Decorated with charming cartoon illustrations, Geo Blocks are like mini-geography lessons for youngsters 3 to 5 (and irresistible fun for grownups who might encounter them on the coffee table). Each of the eight blocks represents a different region—East Asia, Madagascar and the Indian Ocean, the Southern Atlantic coasts of Africa and South America, Central Asia and India, Europe and North Africa, North America, Chilean South America, and Australia and the Pacific Islands—with map images, landmarks, animals, and indigenous cultures. The blocks measure slightly larger than 1½ inches.